Sergeant, Co. C, 7th N. H. Infantry. 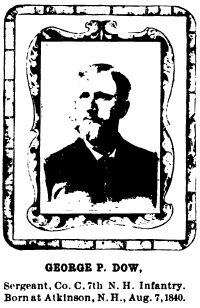 Born at Atkinson, N.H., Aug. 7, 1840. “Advancing we came to a large stream and a bridge over which I led my company. We marched on, but the cannonading was so terrific that we could not hear the bugle from which we were to take orders. Still we advanced till we came to a clearing and presently found ourselves in front of the rebel breastworks mounted with guns and large bodies of infantry lying behind them. For some reason or other the enemy did not open on us. We halted and it was then that I made the startling discovery that my company had been separated from the regiment, which, as I afterward learned, had stopped at the stream. There was but one way out of our dangerous situation; we had to retreat. I gave the order, but in the roar of cannons and the smoke of firing we became confused and we missed the bridge and had to swim the stream. After thus crossing the water we marched for some distance and finally arrived at a farm house, where we found a woman apparently only too willing to help us find our way. “‘Which direction has our line of battle taken?’ I asked her. “She pointed toward Richmond. I knew she was not telling the truth and took my company in an opposite direction. A little later we met one of our aides, who warned us that we were in danger of being gobbled up by the enemy’s cavalry, so we started at a double-quick and found the regiment drawn up in the woods.